Off-grid installation complete at the Bunker! Wow, it’s taken a while to get this posted, but I’ve got the grid-backup system completed at our little house (we fondly refer to it as THE BUNKER…). I was recently out there during a freak snow storm that dumped 5 inches of wet snow in about 2 hours, and when the power went out, there was just a slight flicker of the lighting as I was sitting at the computer checking my email. The UPS on the computer didn’t even get a chance to kick in! I excitedly went downstairs to the basement to check out the inverter, and sure enough, it was on line, quietly humming away, providing full power to the main electric breaker box for everything that was presently on in the house. 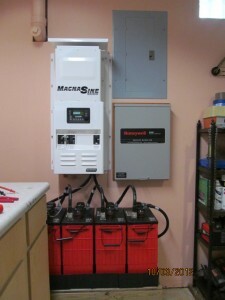 The Magnum MS-PAE 4024 inverter can provide about 4,000 watts of continuous power until the batteries discharge 80% of their capacity. Since the house normally consumes only about 500 watts (average) power, this represents about 20 hours of run time. 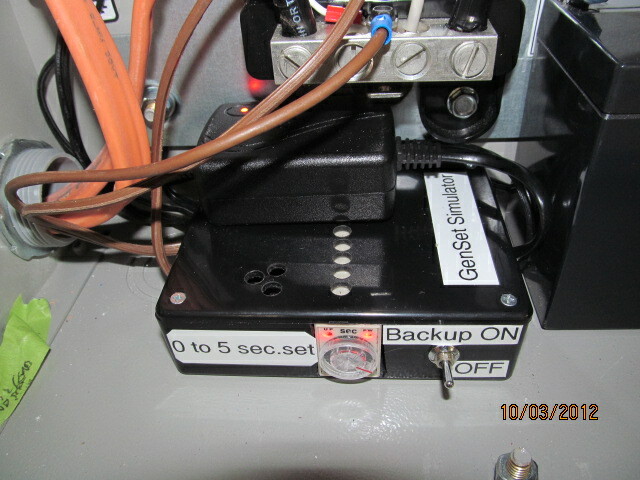 Fortunately, when the backup system is in operation, the solar PV system can “back feed” through the breaker box and provide the power the house needs as well as re-charge the batteries, so this setup can run pretty much indefinitely, as long as there is a few hours of sun each day. Even on a cloudy day, the 2.4KW (Twelve 220 watt panels) solar array provides about 500 watts, so that extends the capacity of the system pretty well. In order to make the TRANSFER SWITCH operate, I had to build my own little GENSET SIMULATOR. It connects to the output of the backup inverter and provides the necessary voltage and control signal to the transfer switch to make it kick over when the power goes out. These TRANFER SWITCHES are designed to normally work with a gas or diesel GENERATOR SET, as they are called. ROLLS 520 AH 6 volt batteries. These are the batteries I chose. Since I’m on a tight budget, I chose the best bang-for-the-buck, and it ended up being the Rolls 6 volt 520AH model. I splurged on the funky looking RECOMBINATION CAPS, rather than the normal vented caps that come with the batteries. 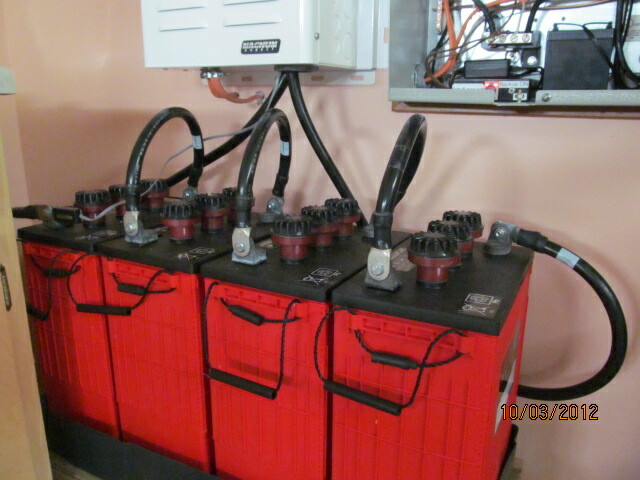 By installing the RECOMBINATION CAPS, the hydrogen gas generated during charging is sealed inside the battery 99%, and the battery loses MUCH LESS liquid over time than a VENTED battery would. A box and vent fan are still required for safety though, and I will add this to complete the project very soon. Without these special caps, in just 30 seconds of charging at 90 amps, the hydrogen gas coming from the batteries would reach 4% concentration and become highly explosive, so this is nothing to fool around with! VENT YOUR BATTERY BANK TO THE OUTDOORS! This entry was posted in Solar and tagged Cinci Home Solar, Cincinnati Solar, DIY Solar, Dovetail, enphase, Icon, off grid backup, Ohio Solar, Residential Solar, solar backup, Solar Consulting, Solar contractor, solar electric, solar energy, Solar Installer, Solar Panels. Bookmark the permalink. How mean panels do l need to connect to (4) 100amh battles? 100 AH (amp hours) is not a large battery. 2 standard 60 cell, 280 to 300 watt panels would do the job nicely. Unless you have more than a 10 amp (DC) load. Then I’d recommend 4 panels. Of course you would wire the panels as 2 series, two parallel, and use a charge controller rated at either 100 or 150 volts DC.